This week’s post is written by guest writer Arun Kumar from RidersTrail.com. Many thanks to Arun for sharing his information with us! Forest fires are based upon something known as the fire triangle. A forest fire needs heat, oxygen, and fuel to spread. Destroying the supply of any one of these elements will help extinguish the fire. The water put on a wildfire reduces the heat and denies the fire the oxygen that it needs to keep going. Call an emergency helpline number and evacuate as soon as possible. Always be on the lookout for any visual signs of smoke, red glow, or smell of smoke. Always travel upwind, i.e., against the direction the wind, and downhill in case of a wildfire outbreak. Never move through canyons, passes, or congested routes. Never try to outrun a wildfire. Try not to breathe in the smoke. Cover your mouth with a wet cloth. Cover your body and make sure you do not inhale the hot gases. Dig a hole in the ground and plant your face inside it to avoid breathing fumes. When doing so, be sure to lie face down with your feet towards the fire. Stay clear of overhead branches. Move towards an area that has already been burnt by the fire. Make sure your clothes are dry at all times. Make sure you protect your body with nonsynthetic clothing that does not catch fire easily. Stay away from synthetic materials. Plan an escape route through places that have already been burnt down. If the place you are at is free of vegetation, then stay there until help comes. Seek professional medical help immediately after reaching the nearby town. 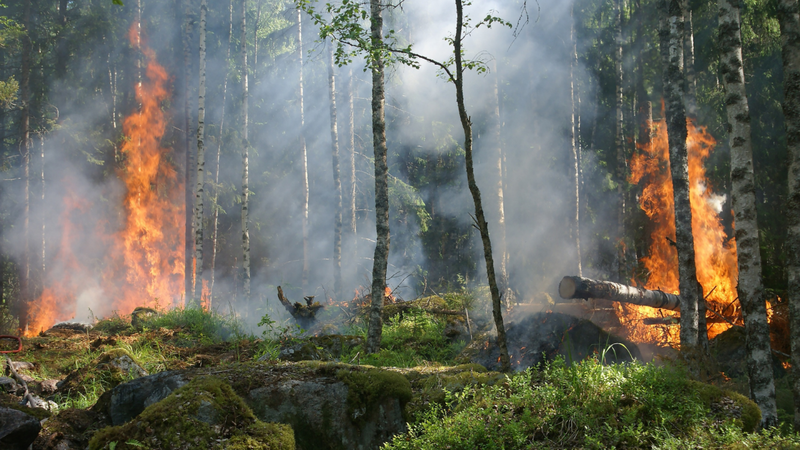 Victims of traumatic experiences such as being in a wildfire tend to suffer from anxiety disorders like PTSD. So it’s recommended to consult a doctor as soon as possible. Below is a helpful infographic for remembering all of these important tips. For more information on preventing wildfire while hiking, visit RidersTrail.com.